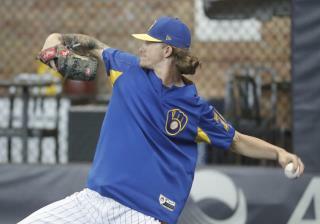 (Newser) – One by one, the Milwaukee Brewers filed into an auditorium at Miller Park as reliever Josh Hader offered his latest apology for years-old tweets that surfaced during the All-Star Game, the AP reports. Those racist, homophobic, social-media messages were thoughtless mistakes he made as a teenager, Hader says. He sought to reassure fellow Brewers that the vile words didn't represent the man he has become, one who has learned—in part because of baseball—to reject the language of bigotry. His teammates had his back on Friday. Fellow All-Stars Jesus Aguilar of Venezuela and Lorenzo Cain, who is African-American, were among those who stood directly behind Hader during a news conference about 90 minutes before the Brewers returned from the break by hosting the Los Angeles Dodgers. "It's amazing. It tells me that they have my back and that we are a true family," Hader says about the show of solidarity. Hader spoke to teammates earlier Friday in the clubhouse. Outfielder Brett Phillips says the reliever offered a sincere apology. Manager Craig Counsell describes Hader as emotional and remorseful. "I just want them to know that I'm sorry for what I did back in the day and the mistakes that I made," Hader says, "and that they are a family to me and that they (the tweets) aren't me and what I meant." The tweets included uses of the n-word and one that simply says "KKK," per this posting. Says Hader: "They were never my beliefs. I was young. I was saying stuff out of just ignorance and that's just not what I meant." That old story, I never meant what I said, I never believed what I said, I was young, it isn't true doesn't hold much credibility anymore. People are tired of it & the only thing that will show he has changed from those beliefs will take time in how he lives his life. Big deal...Joy reed is still on the air. Both Obama and Hillary were recently anti-gay and anti-gay marriage. They flipped and stated that they "evolved" on the subject. Funny how liberals all get away with it but they want to punish this young man for comments made while he was very young. Typical. "As a man thinketh, so he is." Holy Bible.